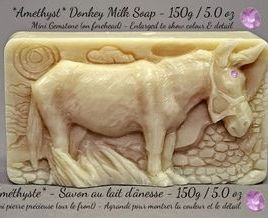 Donkey Milk Soap with Mini Gemstone - So Sweet! CODE: NER-107-A (Amethyst) - colour & shape may vary. Gemstone info included. CODE: NER-107-B ( Fluorite) - colour & shape may vary. Gemstone info included. CODE: NER-107-C (Rose Quartz) - colour & shape may vary. Gemstone info included. Weight: 150 g / 5.0 oz. Size: 98mm x 55mm x 34mm = 3.8" x 2.1" x 1.3". This poor sweet donkey is a real gem! Literally! Embedded on the donkey's forehead is an authentic mini gemstone - Choice of: Amethyst - Fluorite - or Rose Quartz. AMETHYST - Amethyst is the purple variety of quartz crystal composed of silicon dioxide with traces of iron. As a healing stone it is said to be helpful in ridding nightmares. Just hold the Amethyst crystal on the forehead for a minute and ask it to guide you through a peaceful sleep, then place it under your pillow. Also helpful to calm an overworked and over stressed mind. It is thought to dispel negativity and create a peaceful environment. FLUORITE - The colour of fluorite (also called fluorspar) ranges anywhere from an almost clear with green hue to a mix of deep purple and green. Some fluorite even has an aqua colour. As a healing stone it grounds excess energy. Excellent for the mind, as it helps one to grasp higher ideals and advances the cognitive process. An important balancer and healer because of its bipyramidal shape embodying the concept of the heavens and earth being a mirror image of each other. ROSE QUARTZ - Rose quartz is a member of the largest family of stones, the silica group, and is composed of silicon dioxide with traces of titanium. As a healing stone, it emits a calming, cooling energy which can work on all of the chakras to gently remove negativity and to reinstate the loving, gentle forces of self-love. The pink colour of rose quartz has been symbolic of love throughout the ages. Donkey Milk is naturally high in antioxidants, amino acids, Vitamins A, B1, B6, C, D, and E, as well as Omega-3 and -6 fatty acids. It is also naturally comprised of Butterfat, retinol, and a high Calcium content, making it an ideal, nutrient-rich moisturizer. This white, opaque solid brick base does not have any added colors or scents, but the milk content contributes to a smooth and creamy texture while adding a bubbly lather that nourishes skin while it cleanses and gently exfoliates. By hydrating the skin, Donkey Milk softens and smooths while balancing the skin’s pH level. Glycerin, a natural emollient, is included in this base to draw moisture from the air to benefit the skin. It cleanses without stripping or upsetting the delicate natural pH balance necessary for soft, healthy-looking skin. Due to the absence of mineral oils, this soap rinses clean without leaving any soapy film behind.